A DOZEN MASTERPIECES OF MYSTERY, MURDER, AND UNEARTHLY DETECTION! Dip into these wonderfully wizardly concoctions of surprising murder and Asimovian logic that have delighted readers of Ellery Queen’s Mystery Magazine and Isaac Asimov’s Science Fiction Magazine. There are definitely some gems here in this collection of twelve Black Widower armchair mysteries. Perhaps my favorite is “The Redhead” (being married to one myself, perhaps), although I’m not sure why. Perhaps it’s because the Black Widower stories are occasionally rather contrived (although they are rarely obvious—at least not to me). This one, in a sense is on the contrived side, but the solution to the puzzle is so neat and reasonable that it endears itself to me. I also like “The Year of the Action,” having picked up Asimov’s enthusiasm for Gilbert and Sullivan. (It is also a neat exposition of one of the hardest conundrums in the G&S operettas—what is the year of Frederick’s birth?) And “Can You Prove It?” is rather vivid and memorable (and clever), too. 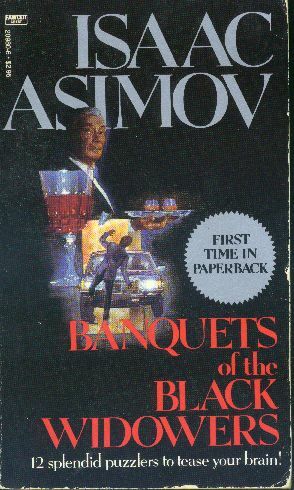 Actually, the characters in this collection are generally vivid, which is unusual for Asimov and unusual for Black Widower stories in particular, which tend to turn on mental gimmicks and not subtle characterizations. Among the other stories, “The Wrong House” and “Neither Brute Nor Human” seem to have people in them which I remember fairly well. On the other hand, there are a few stories here which do not go down quite as well. In several, Asimov is clearly writing of something with which he has no experience. Sometimes he gets away with it (as in “Can You Prove It?”) and sometimes not (as in the first story in the collection, “Sixty Million Trillion Combinations”). Moreover, the second story, “The Woman in the Bar” involves Darius Just, hero of Murder at the ABA. I do not like Murder at the ABA at all, and although “The Woman in the Bar” is rather the better story—frankly, his presence prejudices me against it. All-in-all, I think this may be one of the stronger Black Widower collections. Certainly it contains some of my favorite stories in the series.